Fitness trackers, smartwatches, smartglasses. Wearable cameras, biometric wrist bands and augmented reality headsets. 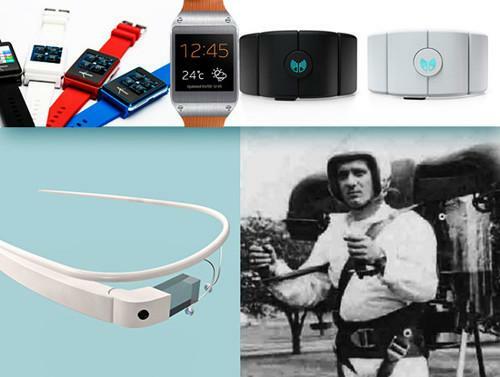 These are just a few of the types of wearable gadgets grabbing headlines these days. At this month's 2014 Consumer Electronic Show (CES), wearable technology took center stage. But while wearables are all the buzz in the consumer tech world, you don't hear as much about wearable tech in the enterprise. In fact, some experts think the true potential of wearable tech, the future of these odd yet intriguing gadgets, lies in enterprise or business use. Like the growth of the Internet and the adoption of the smartphone, though, the evolution of wearable tech won't happen overnight. Experts say smart CIOs and IT managers should be proactive in preparing for corporate wearables but also wary of embracing novel and untested devices. What is the real promise of wearable technology for enterprise? What industries stand to benefit the most? What about security? How, and when, should CIOs and IT departments start preparing and strategizing for wearables? CIO.com spoke with a handful of analysts, experts and executives working with wearables to help answer these questions and more. "Wearable technology" is a broad term, not unlike "mobile," and it encompasses so many kinds of gadgets and systems that it's difficult to identify the specific gadgets that will become truly relevant to your organization -- or when to expect to have to manage them. The first wave of the wearable technology, in which companies worked to identify the various available sensors and determine how they could collect and display data in useful ways, is already behind us, according to Forrester Analyst J.P. Gownder, author of the report "The Enterprise Wearables Journey." This coming year will see the beginnings of "Wearables 2.0," during which companies establish business models and find ways to profit on wearables and related services, Gownder says. The next couple of years (2014 - 2016) will mostly see pilots and early adoption of wearables, with vendors still bringing out finalized versions of their products. During this period, enterprise wearables will start to be used in healthcare and public safety. Developer ecosystems for wearables will begin to mature in 2017, according to Forrester, and apps, back-end software and services for enterprises will become readily available through 2019. By 2020, wearable technology will be common within many organizations -- and in the following four years, through 2024, wearables will become instrumental to how many employees do their jobs, Forrester says. "It's not a gimmick," says CA Technologies CTO John Michelson. "I'm confident that we're going to be seeing a lot of really good stuff coming from [wearable tech]. The business case is there, the technology is there." Fitness trackers and health bands will likely be some of the first wearable gadgets to gain widespread adoption in the enterprise, but smartwatches and smartglasses won't be far behind. "This year is the year of the smartwatch," according to Redg Snodgrass, co-founder and CEO or Wearable World, a group that helps fund wearable-tech startups, connect them with interested businesses and investors, and educate other interested parties. "I think smartwatches will be ubiquitous by the end of the year." Snodgrass also thinks many different versions of smartglasses will become publically available this year, including Google's Glass, but suggests that it will likely be more than a year before they really catch on. Today, less than one percent of U.S. companies have implemented smartglasses, according to research firm Gartner. That number could increase dramatically in the coming decade, with as many as 10 percent of U.S. organizations using smartglasses in five years and half of all companies that could benefit from smartglasses distributing them to at least some of their employees within 10 years, Gartner says. Gartner also thinks smartglasses will begin to have a very real effect on the field service industry as soon as 2017, with a predicted $1 billion per year in related cost savings. Forrester's Gownder says the industries that stand to benefit from wearables in the shortest amount of time are healthcare and retail. Gownder suggestions that the ability of biometric sensors to continually monitor various health stats, such as blood glucose, blood pressure and sleep patterns, and then send them regularly to healthcare organizations for monitoring could transform health reporting. "Under the Affordable Care Act, there are penalties for hospitals that have bad 'outcomes,' so the [wearable health monitors] are becoming very important," Gownder says. "Home monitoring is being used to improve outcomes, and there's much more incentive to improve." Popular fitness trackers -- the Fitbits, Nike+ FuelBands and so on -- seem like consumer gadgets, but they may also have multiple benefits to businesses. For example, fitness trackers could be distributed to employees as part of corporate wellness programs or to encourage team building and friendly competition; incentives could include reduced insurance premiums. "I've talked to several CIO groups that are looking to form large-scale relationships with Basis or Shine or Fitbit. This is something CIOs could do a little bit early on to cut down on costs of insurance," Snodgrass says. "And it's something that's kind of cool. People really enjoy wearing these devices. " The modern retail experience could also be transformed thanks to wearable tech, according to Gownder. Many companies are already experimenting with the idea of identifying customers as they enter retail spaces, to help create a customized and unique shopping experience. Apple's iBeacon uses Bluetooth technology to detect nearby devices and send product updates or other relevant information to customers in certain stores. Apple's system is not based on wearable technology, but it's easy to imagine a wearable-based progression in which customers get much more personalized experiences after they authenticate using biometrics in a smartwatch. "CIOs of retail organizations need to pay attention," Gownder says. "Retail will be huge, and it has the potential to intersect with the entire wearables ecosystem." Snodgrass agrees that retail organizations also benefit from wearables. He envisions inventory managers and sales representatives using smartglasses to provide a better in-store or customer experience. Reps with smartglasses could know exactly how many pairs of shoes are available in a given style and where they are located, as well as which sizes are in the storeroom, so the salesperson wouldn't have to leave a customer or keep them waiting while searching for a shoe in a specific size. Epson's Moverio smartglasses are already being put to use in a variety of professional environments. For example, Evena Medical's Eyes-On Glasses system lets phlebotomists employ Moverio glasses and augmented reality technology to easily locate patients' veins and reduce failed attempts at injections. The Moverio smartglasses are also being used by field technicians to view models of machinery or systems as they repair them. Public safety organizations, including police and security officials, could also realize tremendous value from wearable technology, according to Forrester's Gownder. Just this week, Google spotlighted a New Jersey firefighter who is building an app to let him and his firemen colleagues see blueprints of burning buildings before they enter. Motorola Solutions offers a set of wearable gadgets designed for use by law enforcement and other public safety officials, including smartglasses that show important notifications and ensure officers see them as quickly as possible; wearable cameras that can capture everything an officer sees and hears while on duty, including details otherwise missed in rapidly developing situations; biometric straps for monitoring vitals during high-pressure or dangerous environments, and gun-holster sensors that send alerts to command centers whenever officers' holsters are unlocked. The issue of security is a complex one when it comes to wearable technology -- but some experts suggest wearables can actually increase security without introducing risks that offset the security ROI. "The good news is that there are a lot of promising products out there on the wearables side that will actually enhance security," Wearable World's Snodgrass says. "Biorhythms, identity, encryption and passwords -- these aspects of security will really be bolstered by a lot of the different products that are going to be coming out pretty soon." Snodgrass cites one of the startups working with Wearable World, Bionym, and its wearable authentication gadget called Nymi, as an example of the future of wearable authentication. Nymi, a "smartband" worn on the wrist, measures cardiac biorhythms through the skin to authenticate users. Forrester's Gownder suggests this type of biometric authentication will not only be used for physical access to facilities but, eventually, for payments as well. "I think identification is one of the most important aspects, the tipping point for wearables," Michelson says. Wearables are particularly well suited for authentication, Michelson says, because they attach to your person and are not just in a pocket or on the desk next to you. That makes them harder to forget or to steal. Michelson also suggests that wearables with biometrics sensors are much more secure than physical keys, passwords or smartphones, since biometrics can't be duplicated or imitated. If a Bad Guy steals your smartwatch, for example, he can't use the biometric-based authentication feature. "Identification [via wearables] will be one of those really killer apps," Michelson says. "It will kick the door in" and let people do away with traditional keys and smart keys. "There's frustration around keys and login IDs, and there's a relatively low barrier to entry for authentication using wearable tech." CA Technologies makes access management products, so it's no surprise that Michelson is particularly excited about the implications of wearable tech on identification and authentication. Though he doesn't mention specifics, Michelson also hints that CA is working on some wearable-related security products. "There will be advances in security and identity with wearable devices that will actually make CIOs' jobs better and easier," Snodgrass says. "I've dealt with a lot of CIOs and IT departments, and that's just one piece of wearables that I think will really encourage them, instead of just distract and stress them out." The Wearable World CEO doesn't think it will be particularly cost-prohibitive to implement wearable-based authentication systems. Companies of various sizes and financial means should be able to benefit fairly quickly. "The job of the CIO is to make the machine work more efficiently and better with better security," Snodgrass says. "I think that's part of the promise of wearables." For the next year or more, the smartphone will remain the "hub of where all of these wearable devices interact," according to Snodgrass, so securing that smartphone will be key to maintaining the security of wearables. Most organizations that support smartphones already secure them in some way, so wearables might not require too much heavy lifting at first. Security software makers will extend their offerings to cover popular wearables devices in the future, according to Forrester's Gownder. In fact, some already have. Samsung, for example, offers enterprise security features for its Galaxy Gear smartwatch via its KNOX security offering, Gownder says, even though it is still a smartphone companion device. Gartner Research Director Angela McIntyre suggests it may not be that simple. "A challenge CIOs face with wearables is that the MDM device software is often not yet available from the solution providers. Many of these devices don't even have SDKs to enable security software." McIntyre suggests that companies concerned about wearables and security should first and foremost update their security and usage policies to address wearables and communicate the consequences of violating policies to their employees. CA's Michelson acknowledges the challenges wearables represent, but he predicts the security market will mature along with wearable tech. "Eventually, you'll start to think of wearables just like you think about every other secure enterprise device," Michelson says. "Wearables will mature, companies like CA will provide technology that allows you to manage the devices just like any other app or services now, and you'll hold vendors accountable, just like you do today." As a CIO, Snodgrass says, "your job is to make the machine work and function better. There is an element of security there, but if you're not equipping your workers to go and be successful, move quickly, move fast, you're actually hurting the company and not helping. A data or security breach might get you fired, but not being able to implement the next generation of technology to enhance overall ROI and output of your worker base is, in my mind, a significantly more grievous error." With all the hype around wearables, it's important to remember that this is really just the infancy of the technology. Though it may be time to start thinking about how it will fit into your organization's strategy, it's not time to panic or to rush to implement new technology. "Everyone feels like they missed mobile," Snodgrass says. "I don't think there's a large corporation or a corporate CIOs who says, 'Oh man, this mobile thing, we really nailed it!'" When it comes to wearables, then, the first thing CIOs should do is give themselves a break. "Where they need to be pushing a lot on mobile, on the wearables side, we're still in the early days of form functionality and actual product," Snodgrass says. "Also, a lot of IT strategy with mobile will cross over pretty well with wearables. I see wearables as kind of a natural evolution for mobile." That said, Snodgrass also suggests it's time to start investigating the potential of wearables for your organization and, possibly, reaching out to some wearables makers for proof of concepts. He says Wearable World is a good place for companies to start their research, by reaching out for assistance, attending one of the organization's various events or just monitoring its news feed. "It's time to be proactive," Gartner's McIntyre says. "I speak with companies every week that are already planning pilots." Gartner says enterprises interested in smartglasses should try to identify specific tasks that workers could do more efficiently with the devices, then bring to budget pilots for glasses (and related apps) in 2014. CA's Michelson also suggests that it's never too soon to start preparing and strategizing for the influx of wearables, though he admits it might be years before many CIOs or IT managers need to worry about it. "You can never really time these things; they happen to you. But if you think it's going to happen, you have to get started," Michelson says, adding that it's only a matter of time before wearable tech indeed makes its way into the enterprise. Predictions on when exactly wearables will arrive in the enterprise vary, but wearables appear to represent a real opportunity for CIOs and IT departments looking to improve security, save money and increase organizational efficiency. "If CIOs want to continue to manage and own IT spend around devices, they have got to adapt," Snodgrass says. "Otherwise, more and more of the budget is going to go to the CMO or the CSO, chief sales officer or chief revenue officer, because efficiency is key in this new world. Wearables are going to be able to deliver a significant amount of that efficiency."